Experience Dubai form a bird's eye view. At The Top Burj Khalifa is a must-do tour while staying in Dubai. From the 124th level of this amazing building soak in the views of the city, ocean and desert. 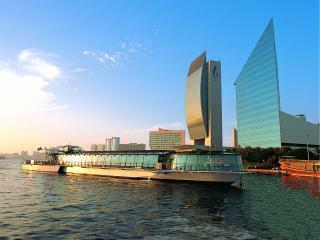 The Bateaux Cruise is a great way to end a day of touring in Dubai. As you cruise down Dubai Creek enjoy watching the city vistas change as the sun sets. 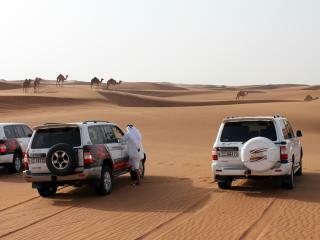 This is a fantastic tour option for your Dubai itinerary. This amazing Arabian desert experience is a must-do on your Dubai holiday itinerary. Travel through the sandy desert in 4WD vehicles, take a camel ride, sand toboggan and enjoy a tatsy BBQ Arabian dinner whilst being entertained. This is a dream come true for those who want to live out the Arabian Nights adventure. The Dubai City Tour is an excellent introduction to Dubai, exploring both the stunning historical and modern aspects of this city. From Dubai Creek, Gold & Spice Souks, the Dubai Museum to the Jumeirah Mosque you can grasp a true sense of the culture and history of Dubai on this full day tour. Ferrari World in Abu Dhabi is a thrilling them park offering fun for the young and young at heart. With plenty of historical displays as well as exciting rides this tour is an adventure in itself. Every Formula 1 and Ferrari fan must check out the Ferrari Park on their next Dubai holiday. 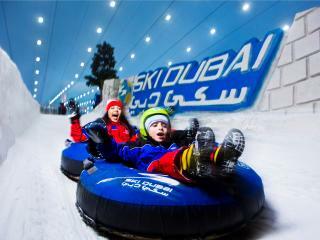 Ski Dubai gives you a taste of the European Alps in the middle of the desert. This amazing indoor ski resort is found inside the Mall of the Emirates so after your shopping, head over for some Middle Eastern tobogganing or skiing at Ski Dubai.